Location: San Pablo Baylands - Eliot Trail at Sears Point. Parking and trailhead at 7699 Reclamation Road (map attached). Please contact below if you need transportation to the trailhead from Vallejo Ferry Terminal or Novato SMART station. 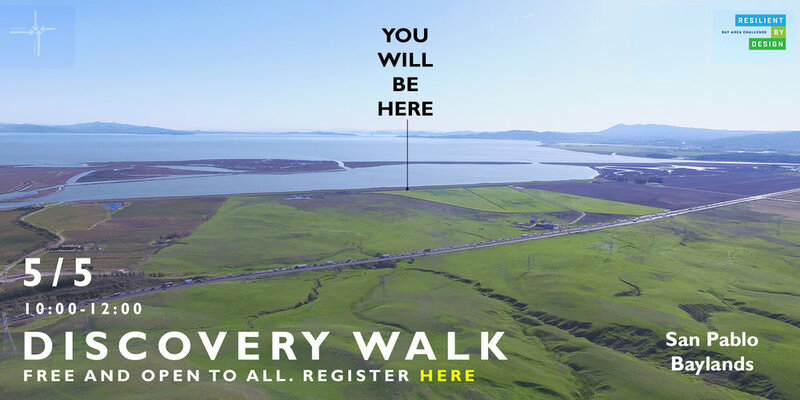 Description: Take a discovery walk in the San Pablo baylands on the new Eliot Trail at Sears Point (2.5 miles walking on flat ground each way) with the Resilient by Design Common Ground Team and the San Francisco Bay and Water Trails. The 10am guided walk will use the Bay Trail's new audio tour to highlight how the Sears Point wetland restoration project is transforming a former diked hayfield into a marshland teeming with life. Learn the how, why, and what of this amazing landscape in transition, and about how the San Pablo baylands are part of regional hiking, biking, and kayaking trails that encircle or connect the entire bay. You are also welcome to come anytime for a self-guided walk (if you want to listen to the audio tour on your own, please download Vizzit Places in the App Store or in Android). This tour is part of outreach efforts by the Common Ground Team who is participating in the Resilient by Design Challenge Bay Area with a focus on strengthening local and regional resilience to sea level rise, severe storms, flooding, and seismic events. We also see this as an opportunity to build awareness about the risks of sea level rise and increase access for communities to be able to enjoy these landscapes. Read more about the team's work here.